Once again, it is my Monday night, and I begin writing my column. Last week's attempt at a column ended up being a fiasco, so as I write this, I'm slightly cautious. It seems that something always happens to derail any and all writing efforts I make, and the column goes up late because of it. This has prompted me to change my update day to Tuesday, but I'm still looking for something to happen. Maybe my new date will keep troubles off my back. I can only hope this is the case, and with slightly more time to write, it might make the quality that much better. I won't be rushed as much anymore, and it should make it easier to do columns even when I travel. At least it will in theory. In gaming news, I have played a TON of Super Smash Bros. Melee. It's a poor substitute for my Earthbound cravings, but it's a Jim dandy game on its own. The odd part is that I don't even use Ness when I play; I'm all about Samus with the occasional Jigglypuff tossed in for sleep chings. At any rate, I'm getting my skills back up to snuff in that game, and I'll be looking for multiplayer when I come home. In still more gaming news, I finally got my hands on the US version of We <3 Katamari. 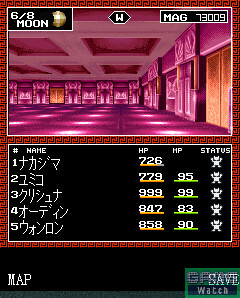 The game is quite funny, but they've changed a fair bit from the Japanese. Most of the changes are small, but they're there. Unfortunately, Namco decided to nix my favorite collection sound in the entire game: the exercising kids. In the Japanese version of the game, they shout, "I'm flexing my abs!" as you roll them up. Now they just make a pitiful scream. Needless to say, I'm disappointed. The game is still fun though. I'm very excited about Boku no Watashi no Katamari for the PSP. It also has the most awesome release date possible, since it comes out one day before I go home for Christmas. I'll be flying economy again, and I'll need something to make me happy for the long flight. It'll do nicely. Also, I'm going to advise every single one of you reading this to pick up the Final Fantasy VII: Advent Children OST when it becomes available in your region. It is my new favorite CD, and I've played it so many times that I've lost count. It's really that good. One final thing is I would like to wish my fiancée a happy birthday. I hope you have a special day today. You'll be in my mind this day, as you are all days. For those wondering about the title, it is in fact Japanese for "pancakes." Pankeeki is also becoming popular, but the bulk of the country still calls them hot cakes. Why is this important? Well while I was chatting with some of the staffers via IRC, we discussed the history of Japandemonium. I referred to the previous columnists as being back in the days before they had pancakes every weekend. I claimed that weekly pancakes are my secret, and should I ever leave my post as Japandemonium columnist, it will only be on the condition that the next columnist keep up this tradition. In all seriousness, I do eat pancakes almost every weekend because they are yummy and very cheap to make. Morinaga Pancake Mix is the absolute best pancake mix in the history of cooking, and with the addition of fruit, chocolate chips, or cinnamon, they make a meal that's hard to beat. They can also be cooked in a kitchen with only one burner; a fact that is extremely important considering my limited cooking options. That said, let's wish Caroline a happy birthday, get out our pancake syrup, and get this party started! I saw something happen this week that I've never witnessed before; the three top spots are the exact same as they were the previous week. Somehow Shin Sangoku Musou 4 Moushouden continues to lead the pack with Mario Bros. 20th Anniversary Edition hot on its heels. So many other games on the chart did not get to keep their coveted higher spots on the chart, and still others were knocked off altogether. Despite a few new faces on the chart, only 12 titles made the cut. It seems the days of single-digit charts is rapidly approaching. I'll just have to wait for the chart to fill up again. Records are meant to be broken, and someday even the record of 17 will be surpassed. At least I hope it will. The chart isn't as impressive as it used to be, but let's take a look at it anyway, shall we? Marvelous Interactive has a new RPG in the works for the Nintendo DS, a system that is getting a lot of new RPGs these days. The game is titled Contact, and it is being developed by the Grasshopper Manufacturers team. 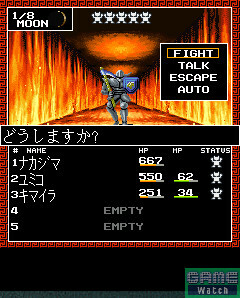 Like many RPGs for the relatively new handheld system, Contact uses both screens, but it does so in a rather unique way. 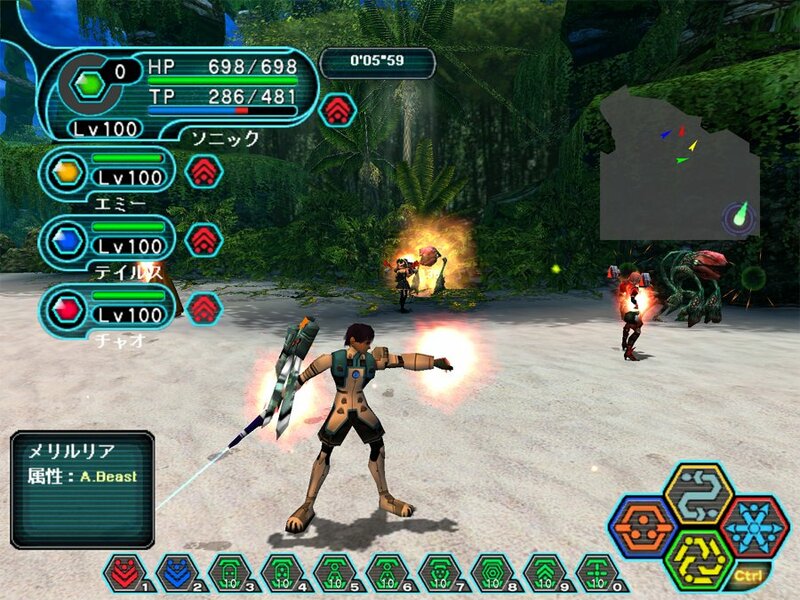 The game takes place in two different worlds, and the player must connect the two by acting as a middle-man of sorts. 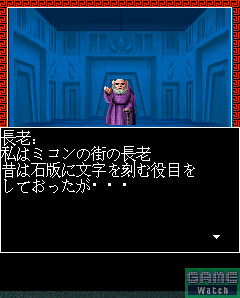 The story kicks off with the Professor, who happens to reside on the top screen. He travels through space in a spaceship powered by a strange substance called "elements," or at least he used to. He has a strange accident which grounds him on a planet and scatters all the "elements" in the process. In the bottom screen lives a boy named Cherry. He finds a mysterious shell one day, and he ends up with the job of collecting "elements" for the professor. But the problem is that Cherry and the Professor can't actually communicate directly. 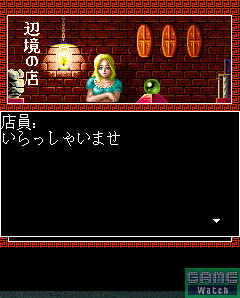 The player has to relay the Professor's requests to Cherry and direct him on the adventure. 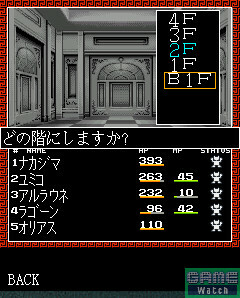 But the player can make Cherry do more than only what the Professor asks for, so it's a bit more than just following instructions from the top screen. To further complicate the matters, Cherry isn't the only resident of the bottom screen. He is joined by a girl named Mint that is an underground idol sensation and the leader of a secret terrorist organization. Mint's not exactly thrilled with Cherry's plans to gather up all the "elements," so she decides to steal them away from Cherry whenever she can. 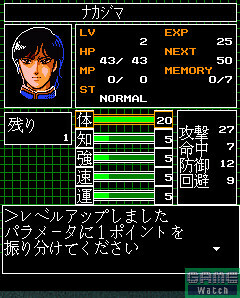 Contact also features some unusual systems, one of which being the "Sticker System." Cherry finds odd stickers throughout his quest, and by putting them on various things like enemies, NPCs, his equipment, or anything else, certain effects happen. These stickers are also necessary to retrieve the missing "elements." Another interesting system is the Costume System. By wearing one of seven different costumes, Cherry gains certain skills that can level up the longer he wears them. Those wanting to pick up this game will be able to do so sometime in February of next year assuming they live in Japan. A North American release hasn't been announced yet. Square Enix's Final Fantasy VII: Before Crisis turned one year old on September 29. As a present, anyone playing the game can receive the Chocobo Materia by accessing the official Before Crisis site. This materia allows players to summon a chocobo to their rescue in battle, or if four are collected, a Fat Chocobo can be summoned for an even more powerful attack. 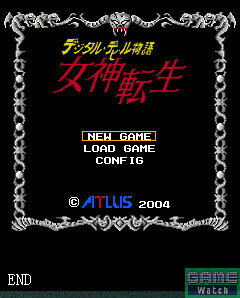 In other cellular phone news, Atlus is bringing one of their classic titles to EZ Web cellphones. 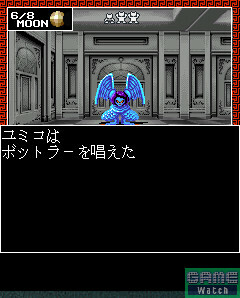 On September 28, those fans wishing to relive their Famicom days were able to download a port of the Megami Tensei title Digital Devil Monogatari which was released way back in 1987, but this is not to be confused with the more recent Digital Devil Saga. 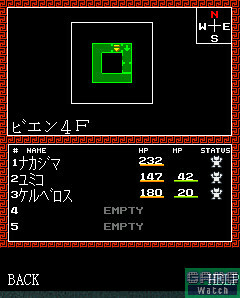 This one is a first-person dungeon crawler, and for a one-shot fee of 525 yen, you can play it all you want and wherever you want. Yet another installment in the Bokujou Monogatari series, better known as Harvest Moon is coming to Japanese PSPs next year. 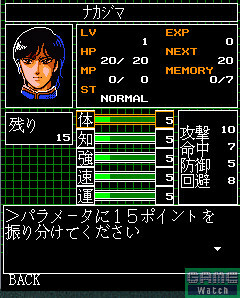 This one is described as a "slow life" Sim-RPG, and it seems to be a little different from other titles in the series. Players will assume the role of a young boy that lives on a tropical island tending his fields. The son of a local grain farmer turned inventor, the Young Boy must work to solve the many mysteries of the island to open more land for farming. Mr. and Mrs. Gayak - An elderly farming couple that is friends with the Young Boy's father, Professor Hope. They are kindly people and are more than willing to answer any questions they player may have. Marcia - Granddaughter of Mr. and Mrs. Gayak. Emma and Lenny Cassak - These two work in Volcano Town and are very friendly. Lionel - A mischievous boy that plays a lot of light-hearted pranks, most of which are harmless. Colobockles - A mysterious race that is believed to live in the forest, but no one has actually seen one. Mermaids - It's rumored that one or two live in Mermaid Lake. Innocent Life is set to grace Japanese PSPs sometime next year. Until then, keep coming back for more information as it's brought to light. The newly merged Bandai Namco is bringing a new installment in Namco's popular Tales series to cell phones. Starting this month, players can download the first chapter of Tales of Commons. 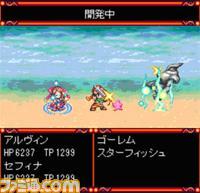 The game will span four chapters with one coming every month. This chapter introduces the hero of the story, Alvin, as he takes a break from his normal wandering around a local temple. By doing so, he meets a young lady named Sephina. Those wanting to know what happens next will have to pay the standard fee of 525 yen per month as the story continues. Banpresto and Softmax are teaming up to port the PS2 title Magna Carta to the PSP. 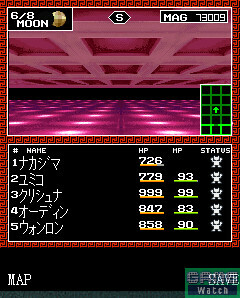 So far, not much is known other than it will get a few updates and get some new material for the PSP. If that's enough to get you to bite, you can pick up your copy sometime this winter. 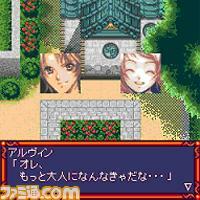 A few more details have surfaced for the upcoming Lost Magic which is due in Japan this winter. Friendly monsters are controlled by tapping on them with the stylus then tapping on enemy monsters similar to a RTS. Also, the art for the game is being done by Studio Ghibli. For those of you that aren't into anime, they are famous for such titles as "Spirited Away," "Princess Mononoke," and "My Neighbor Totoro." This week I got four emails. This means I'm slowly building back up! Heck, one of them is from a guy from my hometown. So that's a pretty neat thing. Keep the letters coming, and I'll keep answering them. I'll answer any and all of 'em so flood my inbox. Hey I was reading your JAPANDEMONIUM article about women rights. I pretty much agree with you on everything cept a little edit you said the business is "almost entirely" men, in the sense of Presidents and CEO's etc, sure you're right, but I work in Honmachi, which is the business center of Osaka, and let me tell you...there are TONS of women, they just don't hold "title" jobs, they're mostly all OL's. I teach 70% business people in my classes, and 80% of those are women. Just wanted to let ya know my view from across the water way ;) So yeh in the big head bosses, it's male dominated(as most of Japan) but actual "business" there's tons of women around, they just don't hold positions of power(cept Aeon, where almost all our managers and up are female) anyway yup i read your articles, see how your views of the country we're living in compare to mine, pretty much even. Give me a shout next time you're near Osaka or Kobe. I was JUST thinking about emailing you, and I never even dreamed that you'd send in a letter to the Culture Corner. How are things up in Kobe? It's a really neat city. I kinda wish I were there. At the same time, I'm glad I'm not. There's something to be said for living in a small town, but since you lived in Frankfort, I think you know as well as I do. Of course, Niihama's a LOT bigger than our hometown, but it's not that big on a Japanese scale. I didn't mean to say that women don't work, I just meant that they don't have any high-ranking positions. Office Ladies (OLs) are EVERYWHERE in Japan. My female students pretty much come in three flavors: Housewife, OL, or nurse. It seems that those are some of the only career choices most young girls have other than being a teacher. There ARE women in other positions, but they are not the norm. I'll also point out that AEON and GEOS used to be the same company some years ago. Thanks for the email, and expect another one soon. Love your article! reading your article actually has effected where I want to go in my life. I do have a quick question for you. I am planning on starting college and get my associate degree in Business. After that if I could I would get a job teaching English in Japan and then work on my Bachelors degree at a college there. Is this possible or do you need a 4 year degree to teach English? Are thereI colleges you would recommend? I'm pretty sure if I plan this route I will have to fully understand Japanese, or are there colleges out there that teach in English? Thanks in advance. I'm pretty sure that getting a visa requires a four-year college, but I'm not completely sure. I'd recommend you ask some of the language schools to confirm that fact. If you want to learn Japanese here, there are schools. I recommend Kansai Gaidai. We sent a staffer there some time ago, and I applied for it and was turned down. They required a 3.0, and I had a 2.9. There are other schools, but you can probably google them. Try contacting a large university in your area, and they can probably give you some more information. Good luck with getting over here. It's not easy, but keep working at it! Just got back from a truly amazing experience in Japan. I never made it to Fuji San, but that's completely fine considering all the other things I subbed for it. I went to Tokyo areas, kyoto, osaka, kobe and Nagoya I made it to the World Expo just in time the second last day. (Did you get a chance to visit it?) Also TGS was quite the experience sensory overload :D.
Want to say thanks again for all your help, you made things easier for when I was there. I'm glad to hear I was able to make your stay in Japan better. Shoot me an email with some stories. I'd love to hear them. It's a really fun country to visit, and if anyone is planning on coming, I'm happy to offer any help I can. Thank you for the column and for and for answering our questions (my question way way back). If you say you only get 3 max. per week, maybe you'll reach the four with this mail! Anyway, I've just a few questions that popped up recently. I saw this movie "Otakus in Love" (which wasn't as funny as I thought) and a few episodes of "Densha Otoko" (which is quite okay) and was wondering how collecting is in Japanese culture. I know "otaku's" are quite avid collectors, but what I remember seeing in a documentary a few years back was that Japanese people aren't really collecting people. Mostly because their home spaces aren't that large to start collecting things. It explained why manga (comics) are mostly made from very low quality paper, beause eventually it gets thrown away after people finished reading it. (so English-translated mangas have better quality paper that their Japanese counterparts?) And that's why second-hand stores (like games) are more common and way larger than in America or here Europe. So is this true what's said and is the a current trend that's chaning (I see a lot more "collector editions" of games coming up the past few years)? And secondly, regarding J-Drama. I've been watching quite a few J-Drama's recently. There are really some bad ones between it, but there are good ones, like Orange Days (which I quite like). Besides the question if you know some nice one - of course - I was wondering about the following: J-Drama seems to last 45 minutes, with most of the time the first episode an hour. The first thing is (maybe a stupid question), do they launch the first episodes (whether it be anime or J-Drama) always at the same time? I mean at the first week of January (or whenever a season starts). This would then result in missing out first episodes of a lot of shows, as you wouldn't know what to watch in that week (series overlapping). Or do they have a lot of reruns? And secondly, are J-Drama's the only kind of entertainment shows in Japan (beside game shows and such)? Do they have sitcoms like "Friends" or "Seinfeld". Yes, There are J-Drama's that are quite funny (like Gokusen), but for some reason J-Drama seems a lot more story-oriented and less just episode-based (a filler structure like - let's say - Doreamon or Hamtaro). Or am I seeing it the wrong way? And how about action-series (like - the old serie - the A-Team) or sci-fi series? I know these are available in anime-format (so to say), but what about live-action? I hope this e-mail made any sense, as I'm not really good in formulating questions. Sorry for the lengthy length, but I hope you can answer them! I suppose a lot of Japanese TV doesn't actually make it outside of Japan with anime being the sole exception. From my limited experience with Japan, they have most of the same TV we do. I've seen children's programming, news at 10, variety shows, and tons of sports. They also get the 'how to speak English' shows that play really late at night. I find those to be quite amusing. From what my students say, there are comedies too. I don't know if they are sit-coms, but they're probably close. Why is my TV experience limited? I've lived here for over a year and have an LCD TV. Why not watch it? I get four channels, and those only work for no longer than one minute at a time. Japan doesn't really have cable like America does, but many people have satellites now. Those in the country like me get to use Antennas for our nearly worthless reception. Needless to say, I don't even try to watch TV anymore. It's only for my PS2s, my GameCubes, and DVDs. That's it. As for the length of seasons, Japanese shows tend to follow a set story arc then finish. This is very unlike America where shows like Friends last for years after they cease to be funny. This seems to be true of most genres of TV. Finally, someone asks me what's up with "Catch you on the flip!" While it pains me to hear that Lizzy uses this expression, I was just thinking of something random to say at the end of my first column. I don't actually use that expression in real life.. But then I decided to make it my catch phrase. It's just a really old expression for "See you later!" Despite having more time, I'm equally rushed to finish. It seems the job does expand to fill the allotted time. That and my work ethic went out the window these past few nights. So my first official Tuesday column finishes, but it's not the only thing that's finished. My beloved Gundam SEED Destiny has decided to finish also leaving me with little to do on my weekends. It'll be a while before I can watch new Gundam eps. That'll make me sad, but there's plenty of older ones to keep me company, and there's always Japandemonium. I'm not going anywhere for quite some time.